Today, this is in the center of the village of Manotick Station, within the limits of the City of Ottawa. My name is Samantha Hawkins Johnson. I almost fell off my chair when I found the following information and your email address. research at the Family Center and plan on going there in April. I look forward to hearing from you and am praying that your email address still works. are Moore (Manotick Station area), Gamble, Montgomery, Spratt, Moffatt and Brulé. Manotick, North Gower Twp., Carleton County, Ontario, Canada    m: Abt. Gloucester Township, Carleton County, Ontario, Canada        d: Abt. As usual, any and all corrections and/or additions are gratefully accepted. I believe I have the goods on the John Hawkins of Osgoode - back to County Wicklow! Wicklow was very close to that of Thomas Hawkins, the McCabe List guy. Thomas Hawkins and Rebecca Dagg. THOMAS and REBECCA HAWKINS (DACK alias DAGG). in ONTARIO, CANADA,  10th APRIL 1838, and later died in PEPIN, Wisconsin, USA. ANNE (2) and EDWARD might be twins? 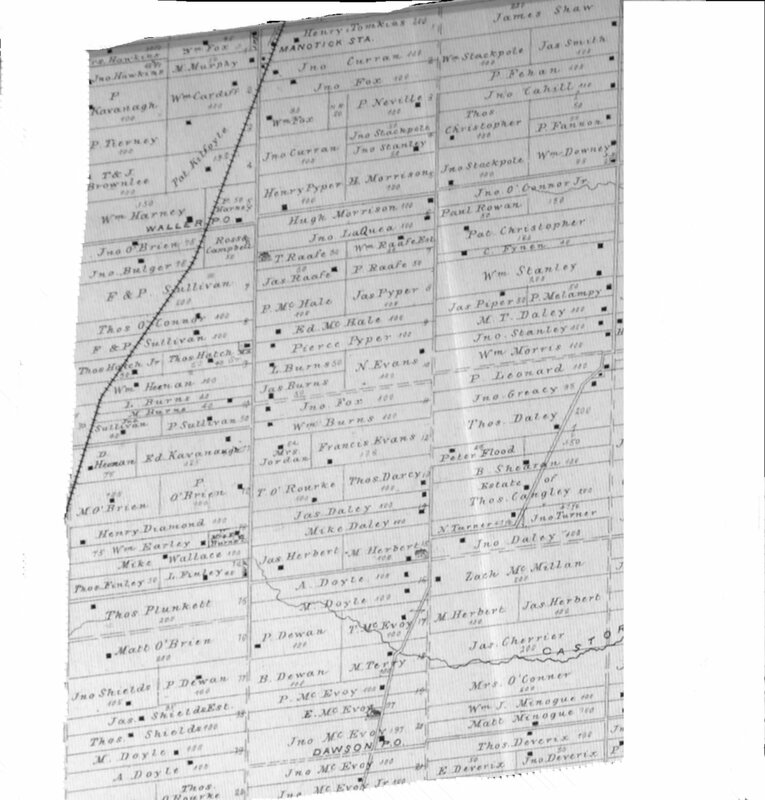 Here are some pioneer farming families located near the village of Manotick Station in 1879. Mrs. Hawkins and John Hawkins are at the upper left corner, bordering on the Mitch Owens Road. Map Source: Belden's Atlas of Carleton County, 1879. Well, that map was SO interesting, Al. married to Ann Hopkins, d/o the McCabe Lister William Hopkins, ML# 233, from Coolkenna, County Wicklow. Coolkenna is where John Hawkins Sr.'s mother, Rebecca Dagg, was from. and if I can provide anything, in return, will be happy to do so. Thanks. living with his brother James William Blair (my great-grandfather) in the 1891 census. Henry never married and died in 1903. Hugh Blair, but she did not, at that time, have Euphemia Hall's parents' names. My name is Ian J. Hawkins. My grandfather was David John Hawkins born at Manotick Station in 1874.
had died. I would like to confirm this. I have read with interest your research and  emails about Moodies, Wilsons etc. Moodie farm, likely the original one. I come from the Shaw, Matheson and Beeman families in Perth on my mother's side. Carleton County. Also come from Rosses of Ross Township near Cobden. Any information that I might help with, I am reachable at the above email. Would appreciate any information on my background. However, my 4 x gr. Grandfather, John HAWKINS (c.1810-1900), is likely to have been the son of Thomas HAWKINS and Rebecca DAGG. This document examines the evidence for each claim. (b) other DAGG emigrants were recorded in the Osgoode area. I believe that this suggestion is in error. On the same page, it is suggested that John is associated with "Thomas HAWKINS, the McCABE list guy". list was prepared, and so b.c.1800. Generation 3 : William HAWKINS b.c.1808 in Enniscorthy, the son of Roger Thomas HAWKINS and Elizabeth GRIFFITH. Generation 4 : Thomas HAWKINS b.c.1832 in Colvinstown, son of William HAWKINS and Mary Ann GRACE. 1. John farmed at Cranareen, which is adjacent to Rustiduff and Killibeg, where Thomas HAWKINS and his wife, Rebecca, lived. valuation of 1854, (iii) his daughter's marriage record in 1863, and (iv) his wife's death record in 1867.
and Elizabeth HAWKINS (daughter of Thomas HAWKINS and Rebecca DAGG). that coincidence of names and dates are not always sufficient evidence. This is all strongly suggestive that my 4 x gr.grandfather was, after all, the son of Thomas HAWKINS and Rebecca DAGG.